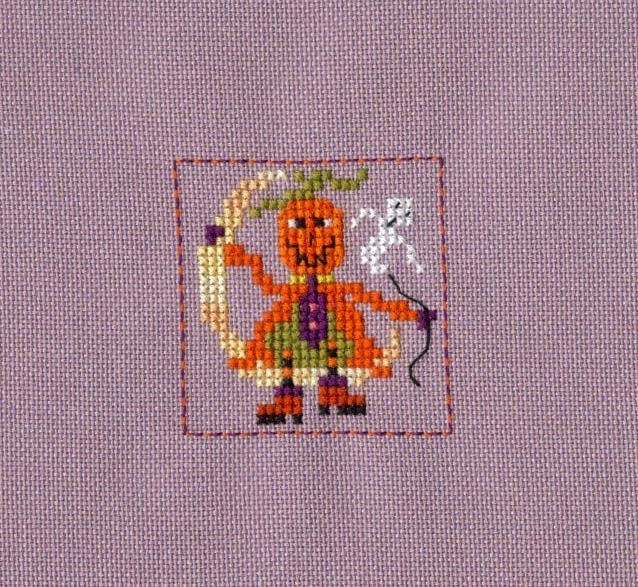 I also continued on Spooky Countdown (which is counting down to Hallowe'en, a great holiday!) and Noel Blanc (for Christmas, another great celebration). I have returned to the left hand side of the design for the final stretch. 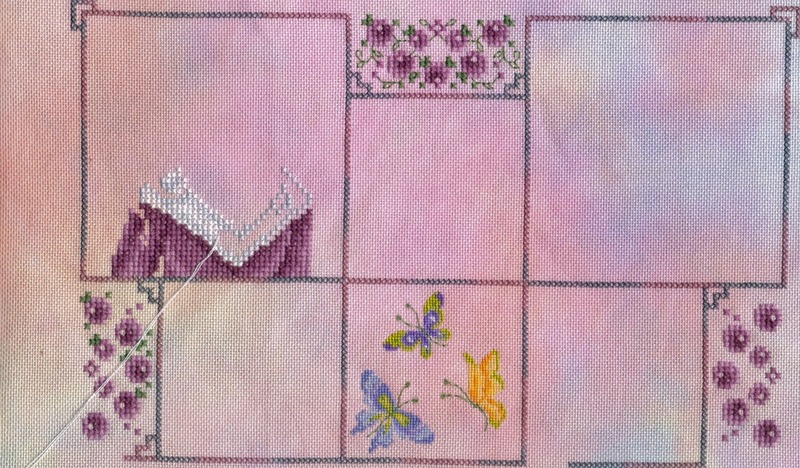 This will be a square border with an over 1 design in the middle. 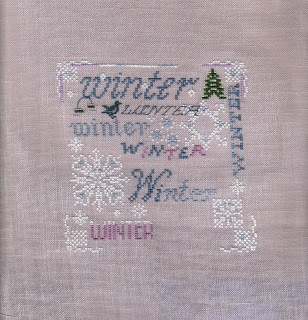 Then we have the word "Decembre" underneath, a large "BLANC" in the middle and a final snowflake on the right hand side. 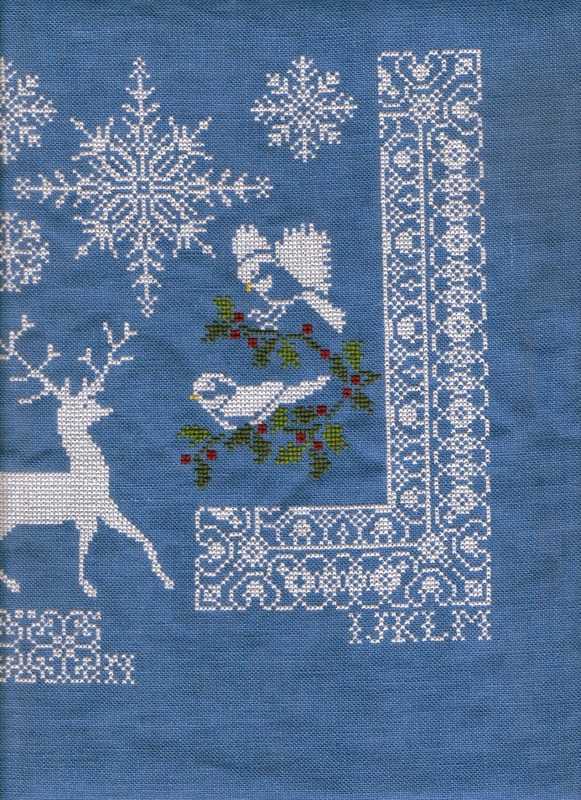 Stitched on 28count Snapdragon evenweave from Crafty Kitten. I used the dark brown hair conversion supplied by Joan, stitched her face over one and used one strand for the wings so there is a transluscent effect with the pink of the fabric showing through. 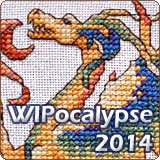 I started the backstitch this evening and will continue with the metallics then the beads. I think I will bead as I go for this design. 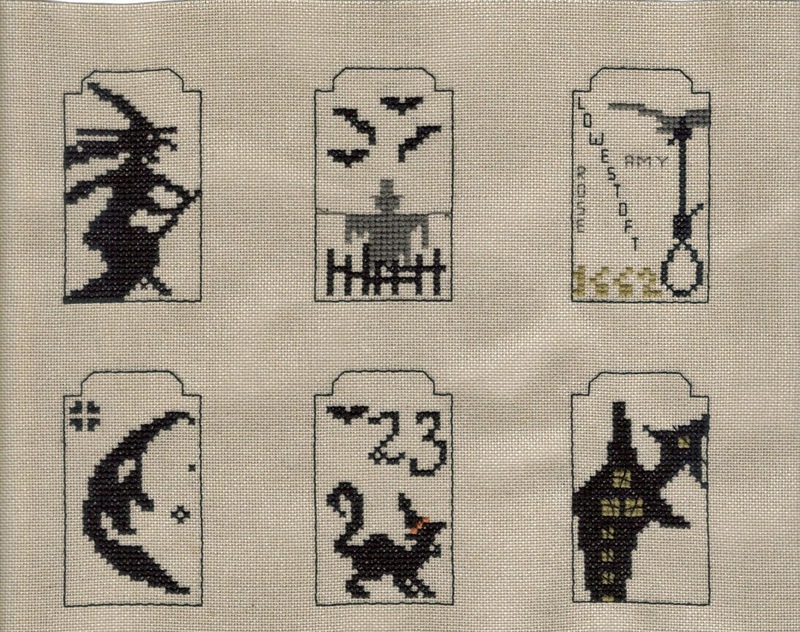 The final small for this month is the continuing progress on Spooky Countdown by Primitive Hare. I am still one week behind Giovanna in our SAL but we've got lots of time built in to complete it by 31st October so who's counting? I wonder what story the sitting up squirrel is telling its little friend? Beatrix Potter's Squirrel Nutkin maybe? Or how about "The Little Squirrel Who Sneaked into a Round Robin for Bunnies" by Karen McEwan? How many of you are reading to your children/grandchildren in the evenings? It's one of my favourite times of the day and always has been. We started with simple board books and picture books, limited to three stories and one poem book each night. As my son grew older we moved onto "chapter books" working our way through the classics from my childhood via anything with a dragon in it and a selection of proof copies from work. I am a great believer in reading the book before the film so we often read books which are due to come to the cinema soon. I also quote alot from books so that's another reason for choosing to read a book, so he recognises the quotes. In the last year or so we have moved on from children's books to my great love, fantasy, especially comic fantasy in the shape of Sir Terry Pratchett. We still read a poem each evening, we have two different books of A Poem A Day and alternate each year. Thanks for the advice on the stitching over 1 for the Joan Elliott SAL, I also asked on the Mirabilia FB page because those stitchers do some beautiful conversions and the general consensus was to rechart and smooth the steps. 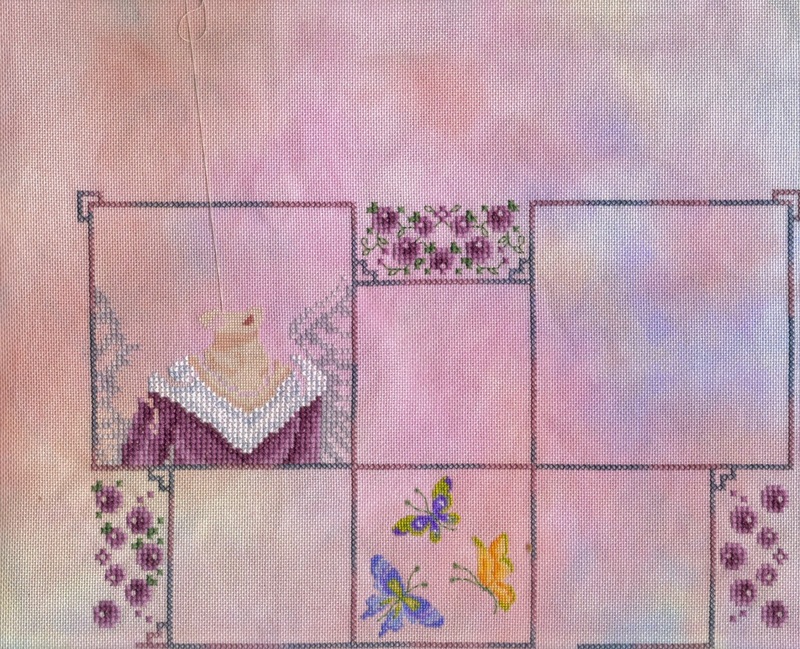 It is so amazing to have such a pool of stitchers to ask advice from, I really appreciate the knowledge we share. Talking of advice, I noticed recently that my blogoversary countdown was stuck on 67 days, as was everyone else's! I reloaded it and the same thing happened; changed the date, still 67 days. So I have replaced it with a ticker which isn't quite as good (it's a bit wide!) but at least it's accurate. If you have this gadget on your blogs you might want to check it out. If you find a smaller one then please let me know! 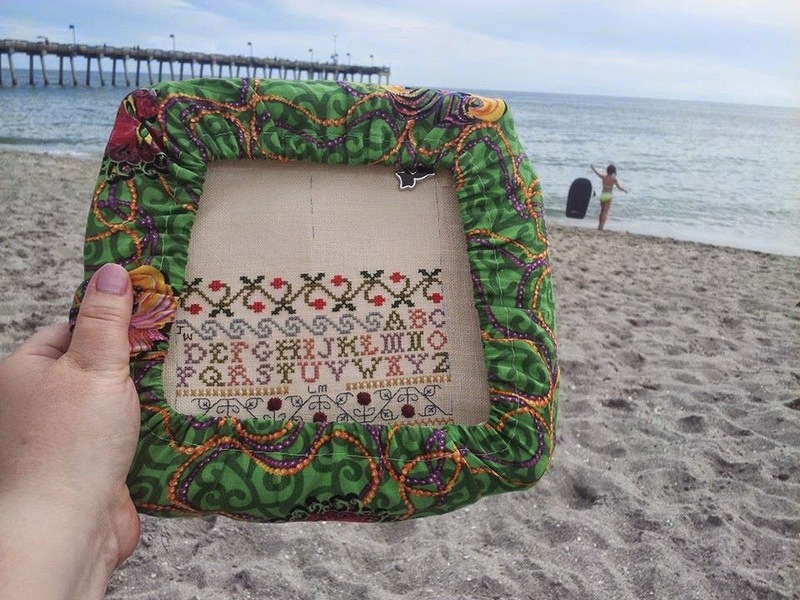 Those of you on Facebook may have become aware of a new event - World Cross Stitch Day. I don't know if there is a website or a blog or if this is just a FB thing but the date is Friday 8th August. 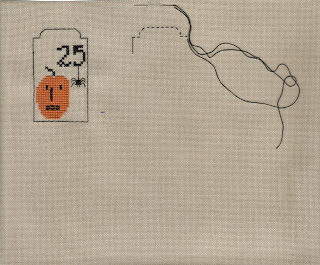 No time zone given, so if you start at 00.01 New Zealand Time and finish at 23.59 Baker Island (Pacific Ocean) Time then you actually get 48 hours of stitching time in total! Finally, another card went out for the Summer Postcard Blog and this one came with a bonus picture from me. Hop over to Krista's blog to see what that is all about. IHSW = International Hermit and Stitch Weekend, or in this case Week! As well as spending quite alot of time stitching at the weekend I decided to spend the last two days of the term stitching too, just in case I don't get so much done during the holiday! 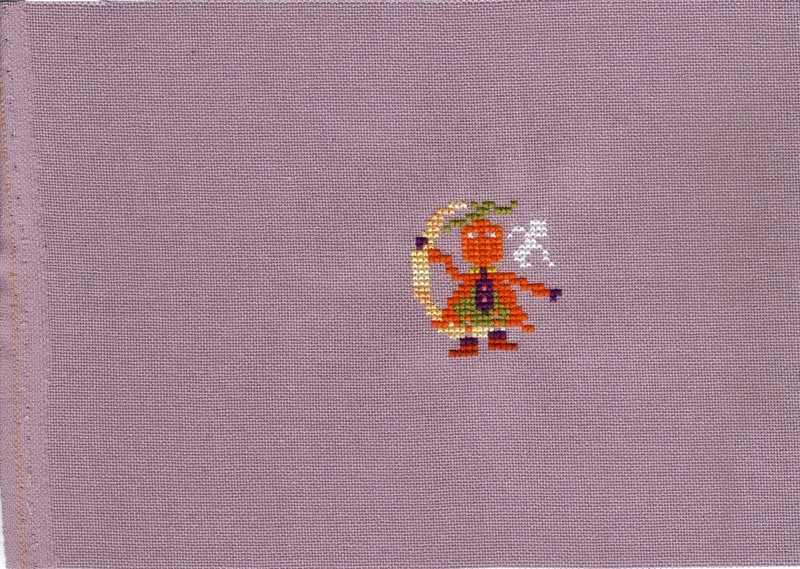 This was stitched on 32 count lavender evenweave using the recommended DMC except for the moon which I used DMC 4090. I also changed the border to a stripy effect. He's very dinky, only 2 inches square. 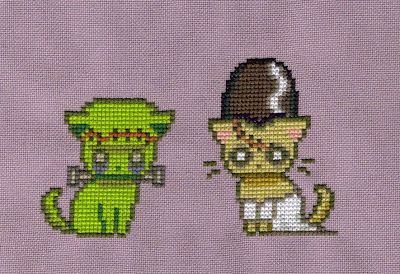 There are two more in the series which I have room for on this same piece of fabric. As yet I'm not sure how to finish them. The next project I decided to work on the first face in the Joan Elliott SAL. This is a FB exclusive featuring reworkings of previous releases. This is Guardian Angel, previously released as a Festive Angel. Joan has changed the colours to suit the SAL and make her less Christmassy. 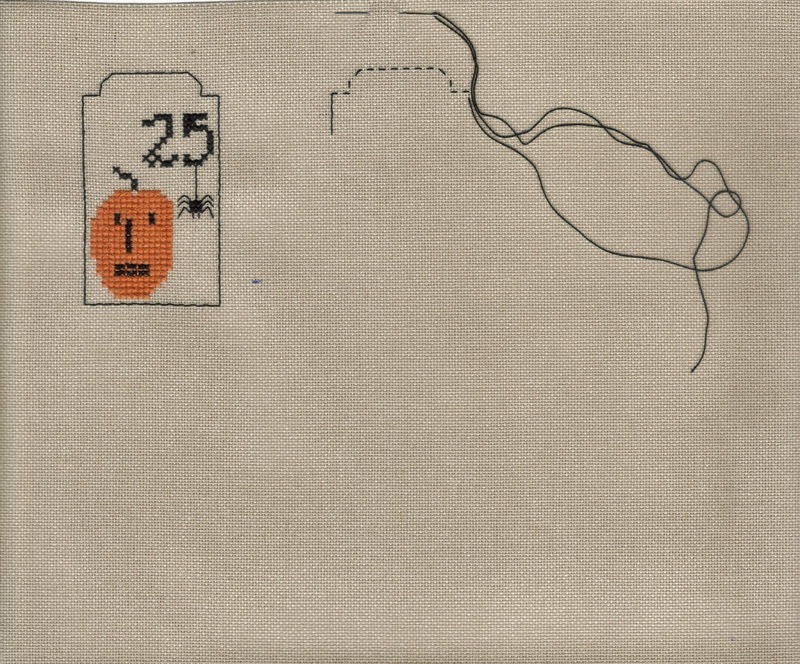 There has been alot of discussion over whether to stitch this SAL over 1 or over 2. Quite a few of us have decided to stitch the skin over 1 but leave the rest over 2. 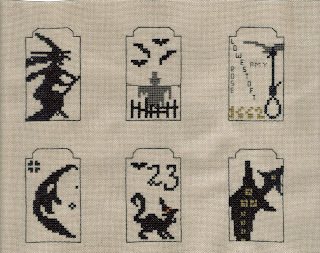 The ones I have seen look lovely stitched like this. One question I do have after looking at some of the over 1 skin - when you stitch this way do you literally stitch four small x for every large X exactly as charted or do you rechart smoothing out the blocks? The second method seems logical to me, but it is more work so I wonder if everyone does it? As you all know the Summer Postcard Blog Hop is now underway. I have sent out five postcards so far and all have been posted on the recipients' blogs. It's not too late to join in, just drop me an email! Isn't it nice when your stitching is better travelled then you are yourself? The other two can be seen on my WIPocalypse post, there has been no progress since then. Finally, the Summer Postcard Blog Hop is now taking place, for more details of how to join in click on the garden picture to the right. Here are the links for the four cards sent so far, why not pop over and leave a comment? Only two more days of one school and three more for the other. The Small Boy did his last day of term at his mainstream school today so I had to remember the wine for the teacher and his one-to-one TA and chocolates for them to share with the other two TAs (and a random work experience girl!). 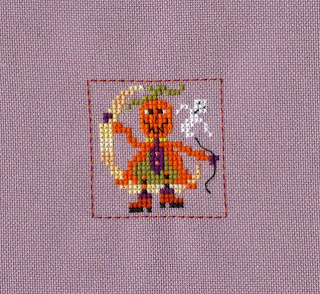 No-one gets a cross-stitched gift this year because he will be continuing in the same class next year. There will be wine and chocolates for his other school next week, he is going up a class there next year but I didn't realise in time to stitch something so it will have to be done over the summer for the first week back! The Large Boy has had a brilliant teacher this year, she has really made their final year in Primary lots of fun as well as working them hard. The league tables and SATs results are making headlines in the UK this week and our school is celebrating with a big improvement since last year. In fact we believe we came top out of all the Primaries in our area, not bad for a school which got a "requires improvement" at its last Ofsted inspection. Hah, what do they know? I wanted a dragon and I wanted books, maybe a little dragon sitting on a pile of books? So I googled around and found this conversion on Deviant Art. She took the standard Futurecaster chart and changed the crystal ball to a book! Perfect. BS - an orange, didn't note number! 6. 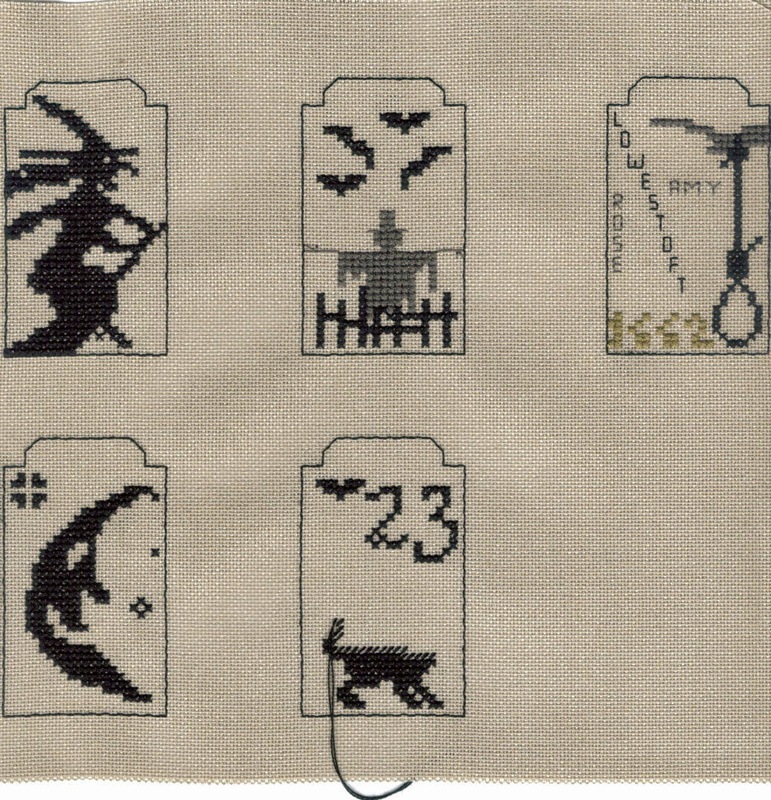 Primitive Hare - Spooky Countdown, the bottom half of a cat! Look, a lovely alphabet after all that long border! It’s halfway to Christmas. 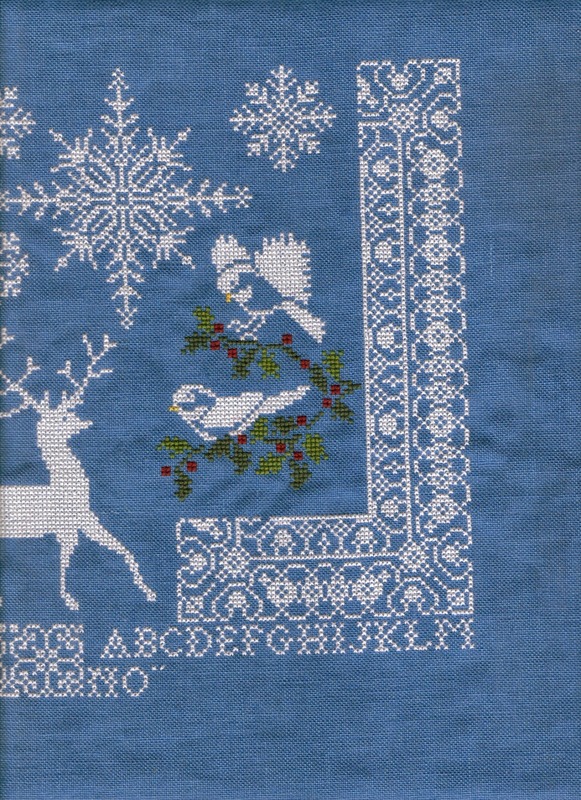 Do you start your holiday stitching this early? If so, what do you hope to accomplish this year? Not bad for six months. Slow and steady does it. 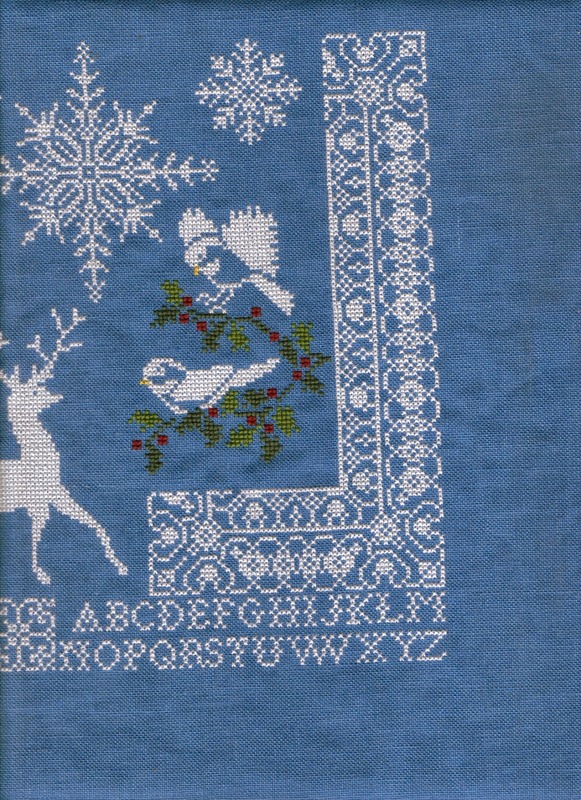 As well as Noel Blanc I will have the 12 Days of Christmas by The Little Stitcher completed. I am unsure how I will finish them. I am leaning towards a 12 apeture multi-frame with some nice wintery mounts for each one. Finally, back to Summer! 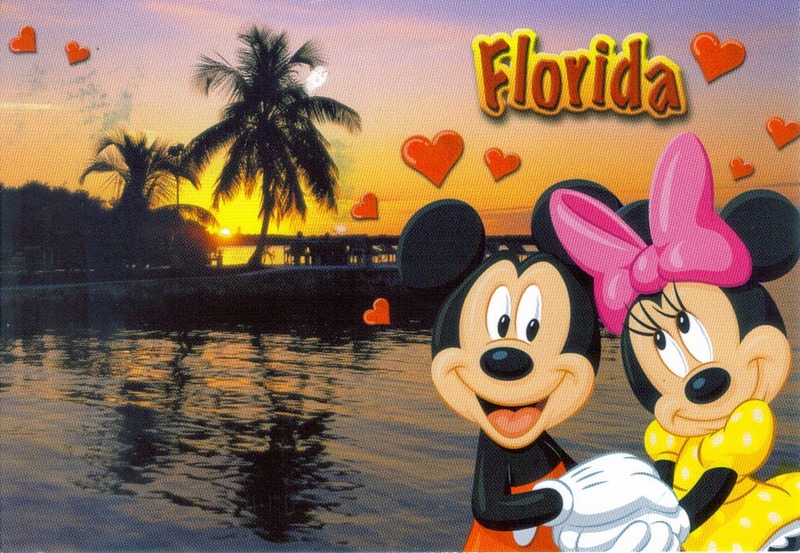 The Summer Postcard Blog Hop is underway. To take part just email me a photo of something you have stitched on the theme Gardens with a nice message, plus an optional photo of your own garden. For more details click on the Garden photo to the right. I've been working on Rahenna's Band Sampler for the Round Robin and was taking some photos when I realised that I never posted about the previous instalment of this RR. So here's a double dose of Band Sampler glory. 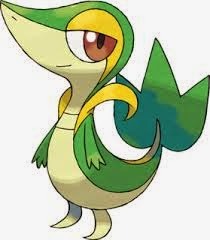 Snivy is Rahenna's favourite Pokemon so she used the colours as inspiration! 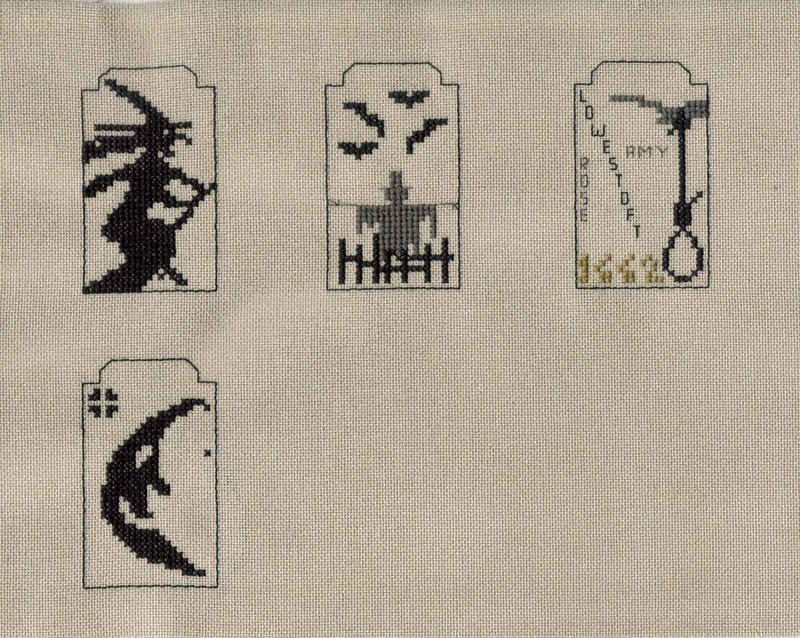 She also sent us a lovely collection of Lesa Steele and Patricia Ann samplers to choose our bands from with strict instructions not to use any other colours other than those provided under threat of being attacked by an angry Pokemon! The whole piece as it goes on to Kathy. I chose my bands from Heirloom Roses but changed the flowers into acorns and added the squirrel. The whole piece as it left to go to Kathy. Finally, the Summer Postcard Blog Hop is underway. It's not too late to send me a photo, in fact you've got until the middle of August to do so. For more details click on the garden photo to the right. I've been working on three WIPs since the last post. 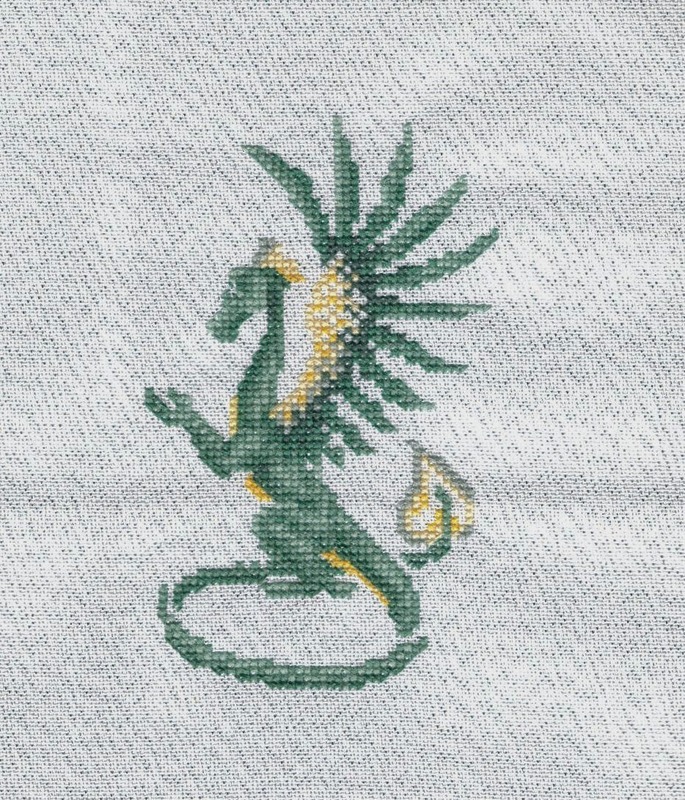 The first one is the Teresa Wenztler dragon I am stitching as an end of term gift for the Large Boy's teacher. She gave me some secret news this afternoon that I can't share yet, but let's just say she really deserves this special gift. 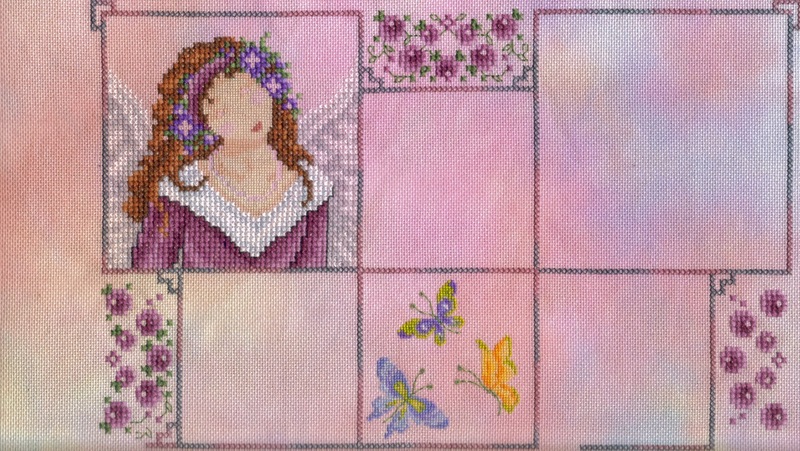 I'm using one of the colour schemes recommended by a previous stitcher with a couple of changes. The darkest green was too turquoise compared to the other three so I changed that, and the yellows were too pale on this fabric so I moved two shades darker for each one. All that is left is his book, the metallics, the backstitch and the lettering. Not bad considering we still have two and half weeks to go. I've gotten a week behind on this one because I started Dragon at the weekend instead. But it's OK, I have allowed 10 weeks at the end of the SAL for the header and footer pieces so if I don't catch up before then I will still have plenty of time. I did all this block on the train and I have another journey planned for next week too. 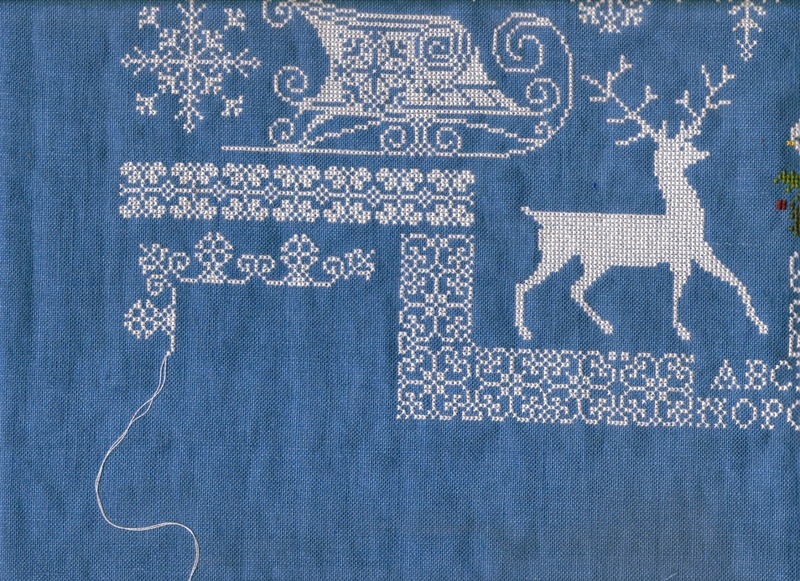 I started that long reverse L of border back in January (2014), stopped at the beginning of March to work on the deer and the left hand borders. Recommenced at the end of May and discovered a massive frog sitting on it. Several frogs to be precise which meant nearly all of it needed to be ripped and restitched. Now I can finally reward myself with a lovely alphabet. Happy Days are here again.